feeling beautiful & confident again! hair loss and grow back your hair.... or we’ll refund the full product price. 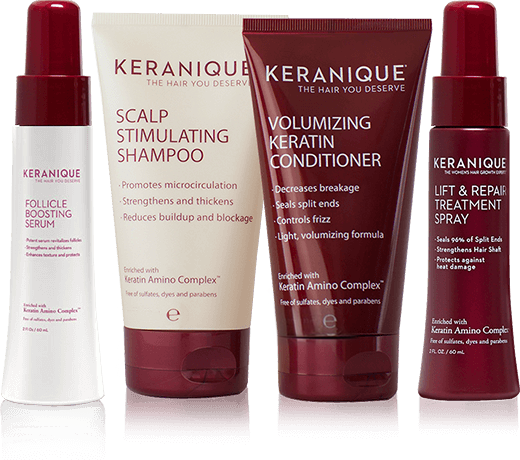 Keranique®, the Hair Growth Experts! 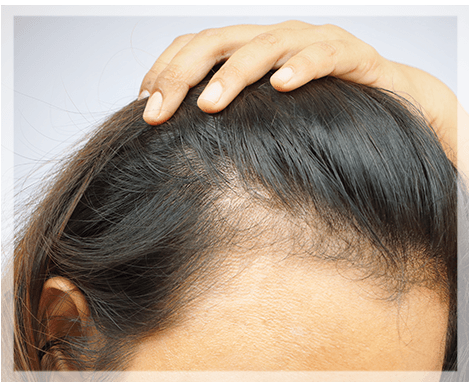 The Minoxidil-Free Treatment to Fight Signs Of Hair Loss! support overall thicker, fuller, longer hair. According to the American Academy of Dermatology, this condition is referred to as excessive hair shedding. This could be due to natural hormone changes, your age, or even effects of postpartum hormones caused by falling estrogen levels. If you just had a baby, it’s normal for your hair to start to thin out after pregnancy. Keranique addresses the root cause of your issues by helping stimulate and target hair follicles with cutting-edge ingredients, so you can restore your hair, making it visibly thicker, fuller, healthier, shinier and stronger again! 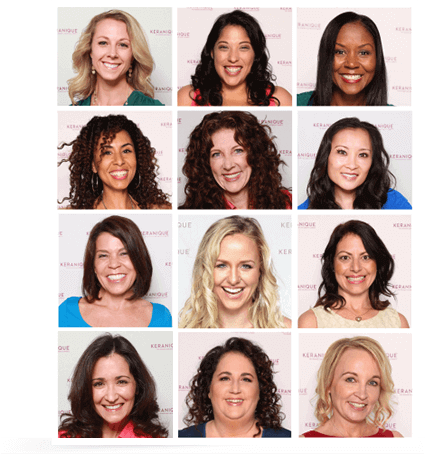 Keranique works for all women of all ages, from new mothers to grandmothers. Click Here to Start Fighting Hair Loss with Keranique! Are you one of the millions of new mothers stressed and worried about postpartum hair loss & thinning? 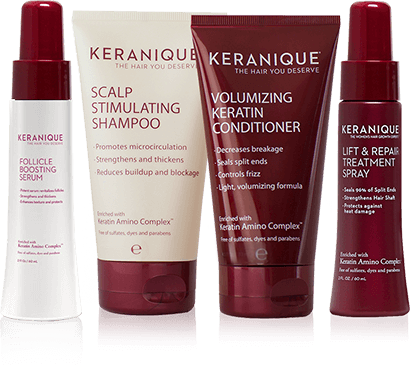 Keranique® offers a pH balanced, gentle volumizing shampoo and light weight conditioner, which works great for postpartum shedding. The Follicle Boosting Serum promotes hair growth and contains Keranique’s patented Keratin Amino Complex, designed to strengthen each strand of hair while reducing thinning and breakage. Moms, you have enough important things to worry about, your hair doesn’t need to be one of them. 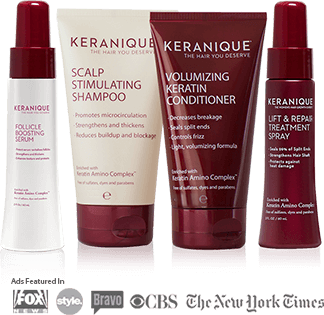 Keranique® will help get back the hair you used to have. The Keranique Hair Loss Treatment and Volumizing System is the perfect solution to reverse signs of postpartum hair loss; however, if you are pregnant or are currently breastfeeding your baby, it is always good practice to discuss any new treatment with your doctor. The “Smart Choice” For Real Women To Grow Natural Hair! beautiful, full head of hair all women deserve and desire. Keranique® Hair Loss Treatment & Volumizing System Real Results! signs of hair loss today with Keranique®. The Hair Growth System Scientifically Designed for Women! Specially targeted to a woman’s biochemistry, the Keranique® System contains a special combination of ingredients formulated to help maintain follicle stem cell function to optimize the hair growth cycle and specifically designed to treat female hair thinning and hair loss. Keranique® is designed exclusively for women’s unique hair needs, addressing hair loss with the Keranique® Follicle Boosting Serum, while strengthening and volumizing hair that is thinning, damaged and prone to breakage. can be revitalized if you address the issue now." Longer, Fuller, Stronger, Younger Looking Hair! Just use as directed, that’s all you need to do! Hair & Fight Signs of Hair Loss. Visibly thickens & volumizes thinning hair with body, bounce and shine. cells for maximum hair growth. split ends & protect against breakage and damage. thicken every hair shaft for the hair you desire. Try The Keranique® System and Save Over $65! Scientifically Designed for All Women!